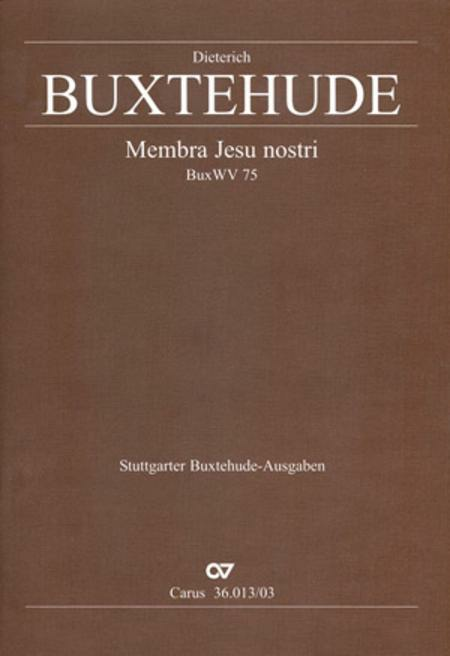 For Passion in 1680 Dieterich Buxtehude composed his largest work in the style of an oratorio, the cantata cycle Membra Jesu nostri, and he dedicated it to his friend, the Swedish Court Music Director, Gustav Duben. 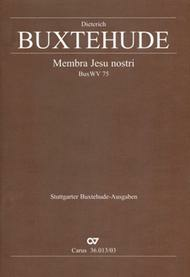 In each of the seven separate cantatas which, in principle, follow the scheme "instrumental introduction - choral movement with biblical texts - vocal soli (aria) with a sacred text from the Middle Ages - repetition of the choral movement," the feet, knees, hands, side, chest, heart and face of the crucified Christ are interpreted allegorically. The original scoring for strings in No. VI (""Ad Cor"") consists of a consort of five gambas. If this group of instruments is not available, then violins I/II can be substituted for gamba I/II and the gamba V parts can be played by the violone (the music for these substitute parts is contained in each respective parts), so that in this case only two gambas (III, IV) are needed. For such a performance only two copies of the Gamba performance score (Carus 36.013/16) are required. Score available separately - see item CA.3601300.